New Delhi: Growth in India’s foodgrain production and agriculture is likely to be much lower in 2017-18 compared to the year before due to lower plantings of rain-fed Kharif crops and an uneven south-west monsoon, Nomura Research said. Summer crop plantings in 2017 are down 0.8% compared to the year before as farmers have cut down the area under pulses and oilseeds in response to lower prices, the note said. It added that sowing has also been impacted by an uneven distribution of monsoon with North-west and southern India receiving sub-par rains, and floods damaging standing crops in several states. In 2016-17, following normal rains and a record harvest of foodgrain and perishables, growth rate of agriculture sector rebounded to 4.9%, after consecutive years of low growth due to drought. During 2016-17, foodgrain production grew 9.6% year-on-year to a record 275.7 million tonnes. “Growth rate in agriculture could be lower than 2.5% (in 2017-18) as foodgrain production is unlikely to rise year-on- year,” said Ashok Gulati, agriculture chair professor at Delhi-based Indian Council for Research on International Economic Relations. “During the first three years of this government (2014-15 to 2016-17) agriculture grew at an average of 1.8% per year. Given this year’s low growth, the target of the government to double farmer incomes (by 2022) is more of a dream at a time when farmers are struggling for survival,” Gulati added. 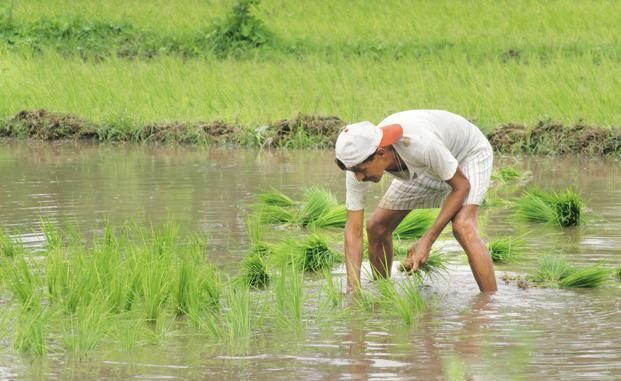 The June-to-September south-west monsoon which irrigates over half of India’s farm land has so far seen an overall deficit of 6% compared to the 50-year average, data from the India Meteorological Department (IMD) shows. However, numbers from IMD show that till 11 September, 236 of the 630 districts for which data is available received deficit rains of 20% or more, while 114 districts saw excess rains of 20% or more. Data on summer plantings show that farmers have increased area under sugarcane and cotton but reduced the area under all other crops such as rice, pulses, oilseeds, and coarse grains. According to Nomura, farmers planted a smaller area under pulses and oilseeds as wholesale prices fell 33% and 14% year-on-year, respectively, in July 2017. “There is little incentive for farmers to plant these crops as realisations are expected to be low—a typical cobweb cycle response,” it said.